With two young children and 2 dogs running around it can be said that keeping our floor clean can be very time consuming. If I do not sweep or vacuum the floor daily the build up of hair is noticeable. My eldest daughter eczema is also triggered by dust and this is one of the reasons we have laminate/wooden/tile floors in almost every room. I am now 27weeks pregnant and have been advised not to run the vacuum around because it is too heavy. I tore my abdominal muscles and have had problems with my pelvis so anything heavy can aggravate the problem and could lead to further complications. This means our current vacuum cleaner is too heavy for me to lift. I was very excited when the Gtech AirRam K9 arrived, it was actually as light weight as expected. I was not sure what to expect as I have never used a cordless vacuum before and I was in some ways expecting there to be lots of pieces to assemble, especially when I saw the size of the box. I was however really surprised, you simply clip the handle in place, then insert the battery and that is it ready to go. There was also have a charge in our Gtech AirRam K9 which was around 20 minutes. The Gtech AirRam K9 uses around 100W of energy whereas an average upright cleaner uses 1360W and has around a 40minute run time on a single charge. It also comes with a Limited 2 year guarantee. On laminate/tiles/wooden floors it simply glides along and you really do not have to put any effort into using it at all. With carpets there is slightly more resistance but it is still really easy to manoeuvre. It can also be used almost complete flat, meaning it can get under the bed to clean there only limited by the height of the AirRam itself. Never having used a cordless vacuum before I was a little sceptical at how well it would actually clean. Given that we have two dogs there is a fair bit of dog hair to collect. 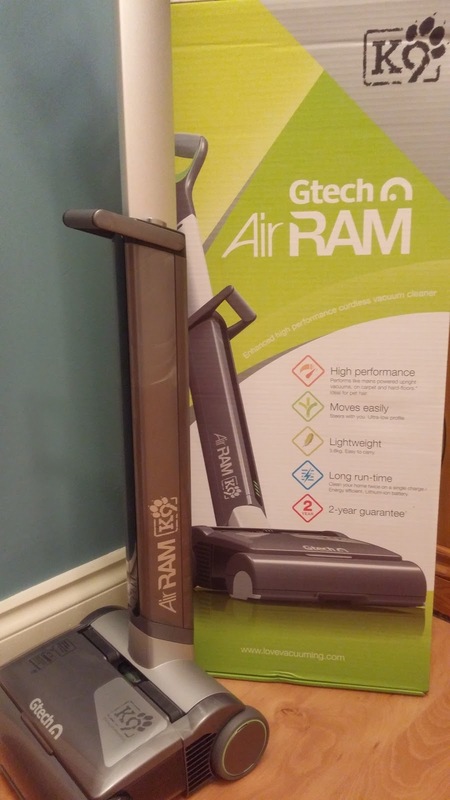 I was so surprised and even my husband said that the cleaning power of the Gtech AirRam K9 is far superior to that of our current vacuum cleaner. There are a few things you do need to be aware of though with the Gtech AirRam K9. The brush bar is only able to pick up dirt on the forward motion, so if you run the cleaner backwards it will drag the dirt towards you, however going over the same spot in a forward action will pick it up. Not a problem but worth remembering. We were unable to use the Gtech AirRam K9 to clean stairs or small spaces such as the car. There is a solution for this and that is the Gtech Multi. The Gtech Multi is a handheld cordless solution to cleaning hard to reach places such as the car and stairs. We live in a 4 bedroom detached house and a 40 minute charge is almost enough to clean the entire house. We can certainly do all of the upstairs or all of the downstairs on one charge, but we need a little extra to do the full house. There is a 1 hour boost charge which works to finish the rest of the house. We tend to empty the dust tray after every other room, less upstairs because the dogs are not allowed upstairs. There is a red warning light that comes on to say the tray is full. Emptying the dust tray is really easy to do. The dirt is compressed into bales so can be simply tipped out of the tray and into the bin. We haven't had any issues with tangling of hair in the brush bar, but we do tend to try and stay on top of long hair by cutting it off the bar at the end of each use. The Gtech AirRam K9 is incredibly impressive at lifting dog hair from carpet, even hair that has got wound into the carpet it seems to lift with no issue. Overall we have been really impressed with the Gtech AirRam K9 cordless vacuum cleaner. We are hoping to try the Gtech Multi next year and hope that this in addition to the Gtech AirRam K9 provides a complete cleaning solution. The Gtech AirRam K9 is certainly a powerful cordless vacuum cleaner that if you have children and or pets will provide you with a great solution to keeping your floors clean and pet hair free. We were sent a Gtech AirRam K9 for the purpose of review. All words are my own opinion. this would be better than lugging the dyson up and down the stairs!